The prototype of this car was named the Lambert & West, but when it went into production in 1913 it was given the name of its maker A. Warren Lambert. The first car had a Precision V-twin engine, but this soon gave way to a Blumfield, also a V-twin. In October 1914 a 1093cc 4-cylinder Dorman engine was announced. Production continued into 1915, despite the outbreak of war and Warren Lambert's departure for the front. About 200 cars had been made when production finally ceased, most of them with 2-cylinder engines. Warren Lambert returned from the war and acquired a new factory at Richmond, and a new engine for his cars. This was a 1330cc Alpha which was used in the touring 2-seaters, but there was also a striking sports car with burnished copper exhaust pipe that ran the length of the car from the bonnet to behind the rear axle. Warren Lamberts were particularly good at hill climbs, a prewar 2-cylinder car having defeated the notorious Nailsworth Ladder in Gloucestershire, but this did not save the firm. 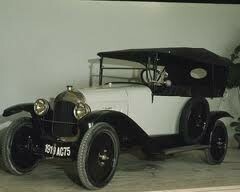 They were too expensive compared with rivals, particularly Morris, and they had no 4-seater in their range. Production ended in 1922.